Let’s get this said at the outset: When it comes to travel, I’m not a big fan of itineraries, bucket lists or checklists of any kind. Vacation should be relaxing. Exploration should be a delight. And there is nothing that kills the joy of discovery or the bliss of goofing off quite as thoroughly as trying to cram too many experiences, too many sights and too many horrific photographs (hey, why do you think they call them “selfies” anyway?) into your precious vacation time. Especially when you’re checking things off a list drawn up by somebody who doesn’t even know you. Like me, for instance. Nevertheless, I know what it’s like to arrive in a strange place without any clear idea where things are or which things are important, and I really dislike missing something really cool and only finding out about it after I’ve gotten back home. And you can’t always trust your local relatives to tell you, either -- I know people who’ve lived here 10 years who’ve never been to the Mission Point Lighthouse. So here’s my short list of “must see, must do” things for folks who really don’t have the time for a long, leisurely tour of exploration. Instead of a formal itinerary -- which never takes into account things like the weather or the fact that your significant other has absolutely no interest in shopping/scenery/history/wildlife/food -- I’ve tried to cluster nearby attractions and activities around each entry in a sort of “as long as you’re in the neighborhood” ploy. Anyway, enjoy. And don’t worry if you still don’t get to see it all. That’s what return trips are for, right? 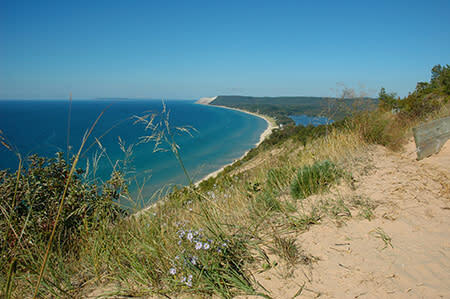 Most people who visit Sleeping Bear just breeze along from lookout to lookout on the Pierce Stocking Scenic Drive. Do yourself a favor and take the time to experience this place on its own terms. Walk along the beach, take a swim or wander through the “ghost port” of Glen Haven for awhile. In the neighborhood: The Leelanau Peninsula has long been a major fruit producer, and today it’s also the region’s most active wine-producing area, with 26 wineries and counting. It’s also home to charming little communities like Glen Arbor (stop in at the original Cherry Republic store) and Leland (check out the unique Fishtown district, where century-old fishing shanties have been converted into unique shops and restaurants). Northport is home to the imposing Grand Traverse Lighthouse, one of the oldest lighthouses on the Great Lakes, and Suttons Bay is a bustling town on the shore of Grand Traverse Bay. A great way to explore the peninsula’s shoreline is along highway M-22, one of the region’s prettiest drives, which passes through scenic villages, orchards and vineyards. Traverse City’s tree-shaded, pedestrian-friendly downtown is often cited as an example of thoughtful restoration and restrained renovation. 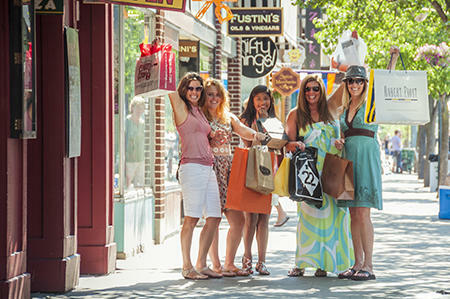 With scores of fascinating boutiques, restaurants, coffee shops and galleries, and lots of places to sit and relax, it’s the perfect destination for an unforgettable shopping excursion. At night, shopping gives way to nightlife as the focus shifts to restaurants and watering-holes on Front and Union streets. Here again, the idea isn’t to zoom past everything on your way to the next attraction. This is a different kind of shopping district, a place where you’re expected to wander around and chat with the people in the stores, relax over a latte or a glass of cider, do a little browsing, check out the amazing City Opera House and the State Theater, have some lunch and just watch the people go by. In the neighborhood: One of the coolest things about TC is how close everything is. When you’ve had enough downtown retail therapy, you can wander a block north and cross to the city’s gorgeous Clinch Park. Stroll through the marina, wander along the paved TART trail overlooking our beautiful West Bay shore, or rent bicycles and have a little coastal adventure. And if you’re interested in seeing some lovely Victorian architecture, head south of downtown and take a leisurely stroll through the shady streets of the Central Neighborhood, where umber barons and nabobs built their elegant homes a century ago. Speaking of architecture, this hidden jewel just west of Division Avernue is the city’s most surprising attraction. 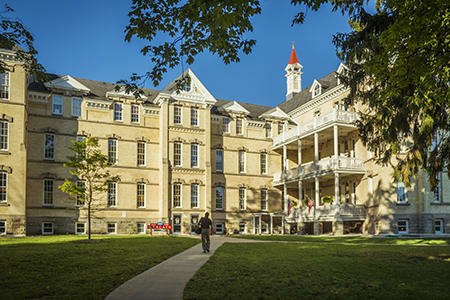 Here, the castle-like buildings of our Victorian mental asylum are set in a 480-acre wooded park that’s become a favorite place for hikers and cyclists. What’s even more fascinating is that it’s become the center of an ambitious historical redevelopment project – the Village at Grand Traverse Commons. These creamy brick structures with their red fairy tale turrets are being turned into restaurants, shops, galleries and apartments. This isn’t the kind of place you can easily rush through. Try as you may, the Commons will force you to slow down and enjoy yourself. You can wander on beautiful footpaths, explore the stores and restaurants in the underground “Mercato” or enjoy a glass of wine and some fine dining in some truly elegant (if truly offbeat) surroundings. In the neighborhood: People tend to drive right past the Commons on their way in and out of town. In fact, hidden behind a buffer zone of forest and wetland, it was designed to be overlooked. Located just south of the Commons campus you’ll find the 25-acre Botanic Garden at Historic Barns Park, built on what was once the asylum’s huge farm complex. To the north is Slabtown, a neighborhood that was once home to millworkers and stevedores from the nearby docks. (It gets its name from the fact that many of these homes were built with slabs of scrapwood from the sawmills.) Check out Sleder’s Family Tavern, Michigan’s oldest continuously operated bar, where you can glimpse what Traverse City was like in those wild days. 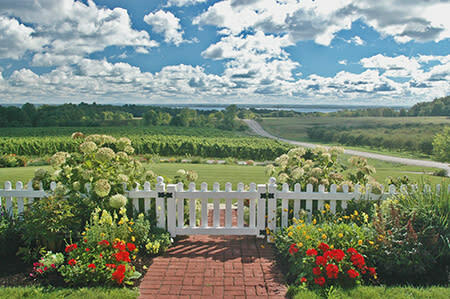 If the Leelanau Peninsula is a broad sweeping canvas where an entire day is barely enough time to see what you ought to see, this narrow ridge of land separating the two arms of Grand Traverse Bay is a miniature jewel box of splendid lake views, orchards and vineyards that can easily be explored in a morning or an afternoon. 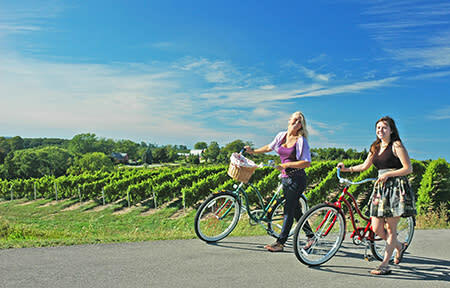 Because of its compact size -- 18 miles long, and in places less than a mile wide -- it’s ideally suited for wine touring. Near its tip is the charming village of Old Mission, founded in 1839 as a community where Native Americans and whites lived and worked together, and the cozy little Mission Point Lighthouse, built in 1870 to warn ships away from dangerous shoals. M-22 may have its enthusiastic cheerleaders, but plenty of people will argue that M-37 between Traverse City and Mission Point is the most scenic road in Michigan. For most of its length, it follows the peninsula’s sharp spine, high above the surrounding farmland and coastland, with plenty of jaw-dropping views and beautiful wineries. For a change of pace, come back on Peninsula Drive, the west-facing road that hugs the shoreline southward from Bowers Harbor -- but remember to drive with care on those curves! There are so many other wonderful places – the Boardman Valley, the Chain of Lakes Country around Bellaire and Shanty Creek, the Forest Lakes just south of town -- that it breaks my heart to stop here. But we’re talking about a three-day weekend here, and it would be cruel to pile on so many destinations that you couldn’t enjoy them properly. Besides, vacation isn’t just about going to new places; it’s also about doing new things. So now, in addition to all these “must-see” places, I’m, adding a few “must-do” experiences. Try at least one of these -- and if you’re feeling ambitious, try several! Nestled at the head of beautiful Grand Traverse Bay, with 180 miles of sugar-sand Lake Michigan shoreline and an abundance of inland lakes, beaches, bays and dunes, this is a place where all the best fun is outside. Head for the beach. Get out on the trails for some hiking or cycling. (We’ve got lots of free maps here at the Visitor Center.) And if you didn’t bring you own gear, you can rent almost anything you need: kayaks, bikes, boats -- even paddleboards! When it comes to food and drink it’s always easier to stick with what you know when you’re on vacation. (Trust me, when my kids were younger, we ate chicken fingers from Arizona to North Carolina.) But the Traverse City is now recognized as one of America’s most unique culinary destinations, and you really ought to try some of our fresh local comestibles. 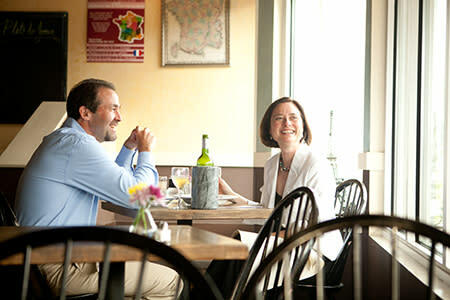 With over 150 restaurants, 40 wineries and 16 craft breweries, there’s something for every taste and pocketbook.